A poussin is a young chicken, usually between 400450g in weight. They are very tender and sweet. 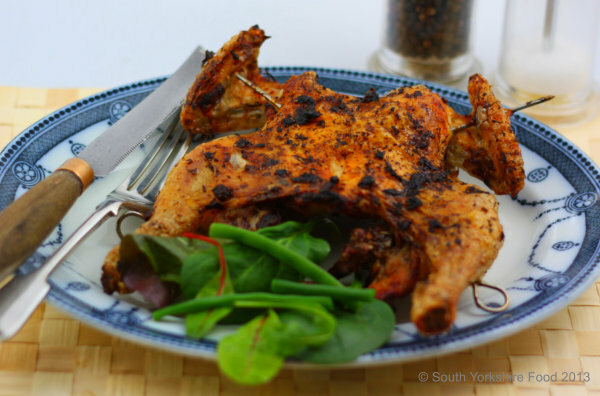 This recipe uses a Spanish influenced marinade that imparts a delightful flavour to the bird. A poussin will serve two for a light lunch or one person as a main course. This recipe has enough marinade for one bird, so if you are using more, then just increase the amounts appropriately. Serves 1-2.
peeled skin of half a lemon, no white pith. Use a sharp vegetable peeler. First prepare the poussin. The easiest way to do this is use a pair of sharp kitchen scissors and cut down each side of the backbone to remove the backbone and tail. Trim off any bits of spare skin from around the neck area. If you wnat to use a sharp knife to remove the ribs from inside the body cavity. Mix together all the marinade ingredients, and put them with the poussin, in a large plastic zip lock bag and put it in the refrigerator to marinade for a least 2 hours. Remove the bird from the marinade bag and flatten it out the on a chopping board with the skin side. Skewer the bird on each side in an X shape, starting at the drumstick, through the thigh and body cavity, and out through the breast and wing. The skewers will hold the bird flat during cooking. Spread a little of the marinade on the skin, with an extra sprinkle of salt. Roast on a rack in the middle of the oven for about 30-45 minutes (depending on the size of the bird), until the skin is crispy and the bird is cooked through. Serve with a green salad as a light lunch for two.